When I first challenged the Elite Four in FireRed, my Pokemon were at least ten levels below the Elite Four's Pokemon and fifteen below Blue's Pokemon. Where can I go/what can I do to make my team stronger? You can battle wild Pokemon in Victory Road. If my memory is correct, to beat the Elite Four in FireRed, I just leveled up my Pokemon by fighting the Elite Four. It both gave me a chance to level up my Pokemon to prepare for the fight in which I actually plan to beat them, and also gives you a chance to beat them while training. (Which I think I did.) The only downside is that you could end up losing a lot of money, so if that's a major concern, you're better off just fighting Pokemon in Victory Road. Also, you could save money doing it by not using any healing/reviving items and saving them so you don't have to buy more for the battles that come after you're done training. However, I'd suggest that you start using them if you unexpectedly do really well. He said his Pokemon were about ten levels underleveled, so he should probably try Victory Road first. One of my favorite places to train in LeafGreen is on Route 11 via rematches. 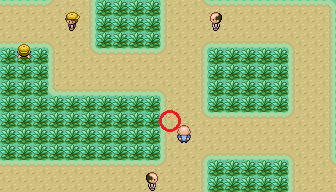 I've found that standing here ( https://raw.githubusercontent.com/KRLW890/krlw890.github.io/master/pkdb-answers/Pokemon_FRLG_Route11.png ) and waiting for the one kid to walk onscreen gets you a maximum of five trainers in one use of the VS Seeker. Then once you've battled all the ones that want a rematch, head on over to Vermilion City's Pokémon Center to heal and recharge the VS Seeker and repeat. Another good place to train with the VS Seeker is Route 8, where you can also get a maximum of five trainers by standing so that these five trainers ( https://raw.githubusercontent.com/KRLW890/krlw890.github.io/master/pkdb-answers/Pokemon_FRLG_Route8.png ) (twins count as one) are visible when the Seeker is activated. To be perfectly honest, it might not even be as good as Victory Road like what other people have been suggesting, but if you're anything like me, and find wild Pokémon much more boring to fight than actual trainers, then here you go. There is various places and methods, however the easiest and fastest is defeating wild Pokemon in the victory road, like the other guys already stated.